Growing up in South Texas, I was a regular customer at Taco Cabana! Can I get a shout out from all you TC lovers? We would go there daily for lunch, and maybe even for dinner the same night. Had to get our “bean and cheese” fix and then enjoy their delicious “tortillas and queso”! This is my tribute to TC…except a little on the healthier side! (Warm tortillas in oven or microwave). Cook diced potatoes in small amount of water in bottom of skillet (use oil if you prefer “greaser” potatoes!). Season with S/P, or other “seasoning”. When cooked, transfer to plate. Scramble 6-8 eggs in the same skillet. I like to add a little milk in with the eggs. Season with S/P. Once eggs are almost fully cooked, stir in potatoes and mix. Let eggs and potatoes finish “mixing flavors”. Here’s where you’re choice comes in…. Option #1 add cheese to potatoes and eggs in skillet. Let melt. The spoon into tortillas and roll. 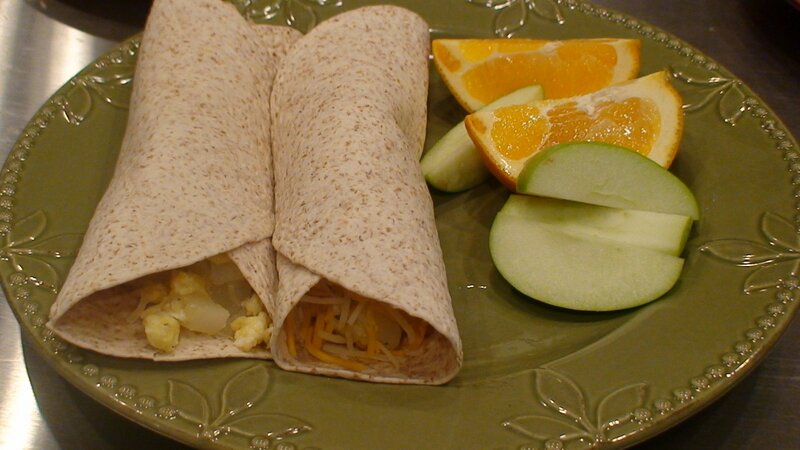 Option #2 spoon egg/potato mix into tortilla, then sprinkle with cheese. Roll to eat. Enjoy some goodness and try to keep the eggs/potatoes mix from falling out the bottom! That sounds great! Thank You. I may add some diced hot peppers though, we like things spicy around here! umm.. can I just say how pure genius it is to cook the vgegies in beer? These look so good I love tacos, but sometimes I get bored with the normal taco fillings. I’m definitly going to have to keep this recipe in mind next time I’m craving Mexican food! Oh, how I miss Taco Cabana. Loved their chips and queso. Tortillas too. Be happy to send you any TC anytime. IF i could keep it warm that is. I’m going to make these tonight! Maybe add a little dehydrated onion, maybe some salsa too. Hell, maybe I’ll break out the quesadilla maker and make quesadillas out of it. They freeze pretty well! At least my husband doesn’t complain about eating them after thawing them! If you freeze them, how do you thaw and re-heat them? how do you reheat these after freezing them?? I reheat them in the microwave…part defrost, part full heat. If you let them thaw in the fridge, the tortillas can get soggy!